Justice Thomas said Americans today are more likely to say, "Ask not what you can do for yourselves or your country but what your country can do for you." 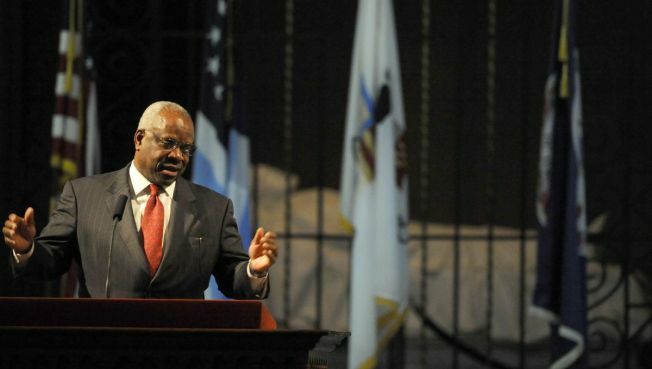 LEXINGTON, Va. — Americans today are self-indulgent and don't make the sacrifices that their parents and grandparents did, and the nation's leaders don't ask people to act for the higher good, U.S. Supreme Court Justice Clarence Thomas said Monday at a Virginia college in a rare public speech. "Our country and our principles are more important than our individual wants," Thomas told close to 400 people who greeted him with a standing ovation at Washington and Lee University, a Shenandoah Valley liberal arts school. He quoted President Kennedy's famous, "Ask not what your country can do for you" speech, but said Americans today are more likely to say, "Ask not what you can do for yourselves or your country but what your country can do for you." Thomas took his seat on the court in 1991. He and Justice Antonin Scalia are considered the core of the court's conservative 5-4 majority. Thomas endured a grueling confirmation process over allegations that he sexually harassed a former staffer of his, Anita Hill, who testified during the Senate hearings. Since then, he has been one of the less public members of the court, although he has made several appearances to promote his 2007 autobiography. Thomas referred to that book, "My Grandfather's Son," as he described the obstacles he dealt with growing up in the segregated South in the 1950s and 1960s. The court's only black justice spoke with reverence of the priests and nuns who taught him at what had previously been an all-white Roman Catholic school that he began attending in 1964. "They were the ones who taught us we were inherently equal," said Thomas, a Georgia native. Speaking in Lee Chapel, where Confederate Gen. Robert E. Lee is buried, Thomas told a questioner that Lincoln was his favorite president. "We always saw Lincoln as the great emancipator," he said. Thomas told the crowd he declines most invitations, but was persuaded to accept the one from William and Lee student Robin Wright. He had met her as a young child, he said, and had known her mother, U.S. District Judge Susan Webber Wright of Arkansas.